Certified & Formal Written Appraisals – The Treasure Traders, Inc.
We offer FREE initial assessments of individual items, collections, and estates to assist in determining the extent of the required appraisal service. Our appraisals meet all required IRS, legal, and USPAP conditions to function as qualified valuations of personal tangible property. The Treasure Traders are uniquely equipped to appraise estates, collections and family heirlooms encompassing a diverse selection of material. While generalists make educated guesses, our specialists have years of experience which in turn enables Buccaneer Trading as a whole to provide the best appraisals across a tremendous range of subject matters and catagories. All appraisals will require an Appraisal Agreement to be signed by the client prior to any work on the appraisal. Our competitive fees are based on an hourly or daily rate per specialist plus any applicable travel and out-of-pocket expenses. Contact our Appraisal Services specialists for specific terms and fees associated with the appraisal of your property. All estimated fees will be provided and agreed upon before commencing any appraisal work. Fees will be invoiced and payable upon delivery of the final appraisal report. 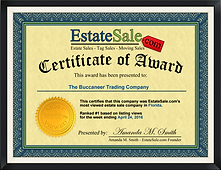 Should you later choose to sell property listed in a Buccaneer Trading appraisal through a estate liquidation sales, online auction, private and or brokered sale, the appraisal fee is rebated against the Seller's Commission in full or prorated based on the value of the property bought outright or consigned for sale. Put Our Award Winning Services To Work For You! * We are always accepting individual items, collections and estates on consignment for future gallery sales, online auctions, brokered sale or even for outright purchase.